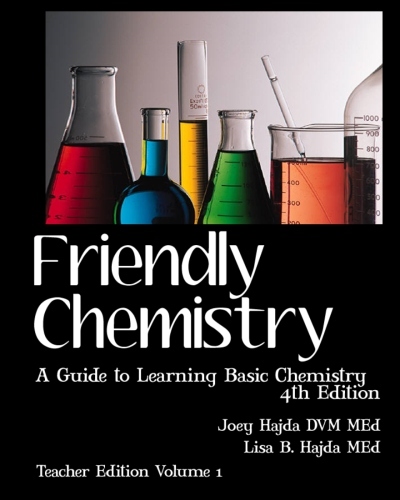 There are several components within the Friendly Chemistry curriculum. Find your teaching situation below to determine which components to order. If you’re not certain what to order, contact us and we can help you! Note that we have two versions of the Teacher Editions: the “original” version designed for groups of learners and the for-one-student version where only one child is taking the course. The student textbook is the same for either version. Contact us if you’re not certain which version to purchase for your situation. Order fulfillment is made through amazon.com. Printed materials are amazon Prime eligible. Military families, missionary families and members of Schoolhouse Teachers.com are eligible for discounts. Contact us for details. Step 1: Find your teaching situation below. Situation 1: “We are a family with just ONE child taking the course." -Test Bank pdf (optional) Tests are found in the Teacher editions; this pdf makes printing more convenient. Situation 2: “We are a family with MORE than one child taking the course together at the same time." -Student Textbook for each child OR Student Workbook(s) for additional children beyond first child. Situation 3: “We are a co-op group with students coming from two or more families to take the course." Situation 4: “I am a classroom teacher with a group of students." -Student Textbooks for each student. Note if you wish to maintain textbooks for future students, you can purchase separate consumable workbooks. Please call for assistance when placing your order. We gladly accept school purchase orders. Step 2: Choose the curriculum components you need. CURRICULUM COMPONENTS. Click title to select. You will be redirected to amazon.com to complete your order. Test Bank pdf - Your order will be handled through Paypal. We will recieve your payment and reply with your pdf. Click the yellow “Buy Now” button below to purchase your pdf. DVDs: Click "Order DVDs" on dropdown menu. Please note that 3% of ALL sales go towards support of the WATER 4 HAITI ministry. Learn how you can support this amazing ministry which provides fresh water through the digging and maintenance of wells here.